Florida native Helianthus debilis (Dune Sunflower, Beach Sunflower) is one of the easiest to grow wildflowers. You might have seen this growing along the beach where they bind and stabilize sand dunes. Their bright yellow blooms remind us of rays of sunshine on a warm sunny day. Dune Sunflower has a long taproot with many lateral roots. These roots work together and help the plant store water in a drought. This is ideal in the home landscape where a tough, drought tolerant, full sun plant is desired. Once Dune Flower is mature, you can expect a spread of around six to eight feet. For this reason, Dune Sunflower is commonly used as a ground cover, so give this one plenty of room to grow. This wildflower also looks amazing in a mixed wildflower bed. Plant with other drought tolerant wildflowers such as Gaillardia pulchella (Blanket Flower), Salvia coccinea (Tropical Sage), Liatris chapmanii (Blazing Star), Monarda punctata (Dotted Horsemint), Opuntia stricta (Prickly Pear) or Solidago sempervirens (Seaside Goldenrod) to name several. Dune Sunflower reseeds itself prolifically and will reward you with new plants year after year. Seedlings are easy to dig up and move to a different location in the garden. You may also wish to take stem cuttings that root quickly in a pot of moist soil until ready to be transplanted to a desirable location. There are three different Florida native subspecies of Helianthus debilis to consider when choosing the one you want to grow. Depending on your location, choose the one that already occurs naturally in your area. This is especially important if you live on the coast where a distinct species already occurs. Be aware that each species plays a special ecological duty in their native habitat. On the east coast you will find Helianthus debilis (East Coast Dune Sunflower). In the north west you will find Helianthus debilis subsp. cucumerifolius (Cucumberleaf Dune Sunflower) while on the west coast you will see the endemic Helianthus debilis subsp. vestitus (West Coast Dune Sunflower). When purchasing Dune Sunflower from a native plants nursery, be sure and ask what species they are selling. 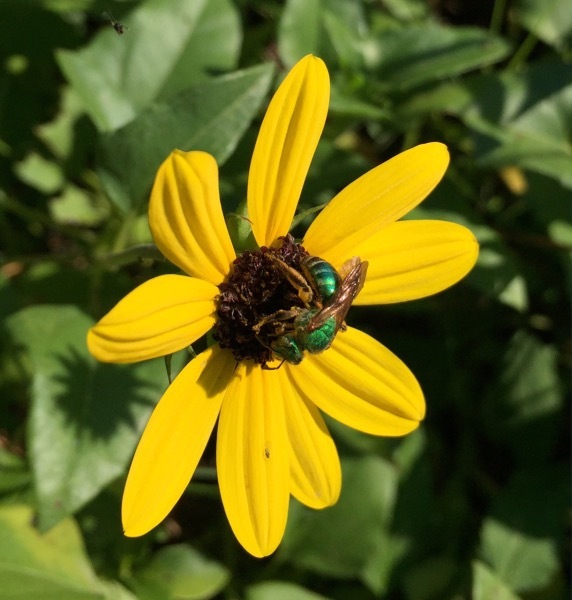 Dune Sunflower is enjoyed by many pollinating insects such as native bees, butterflies and beetles. The dense foliage also provides a good cover for smaller wildlife. You might see lizards, an array of insects, frogs, and little birds finding refuge under this wonderful groundcover. It is not uncommon around here to see a Black Racer snake hiding in Dune Sunflower searching for food. Great article, and lovely photos.